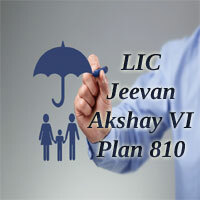 LIC Jeevan Akshay VI (Plan 810) is a Single Premium, Immediate Annuity plan. This immediate retirement plan which provides monthly pension throughout the life on one-time premium payment. Jeevan Akshay VI Pension Plan offered by LIC helps the individuals adequately for their retirement. With the high-speed rise in the cost of basic needs, your savings today might not reach the cost of necessities throughout the retired life. Jeevan Akshay VI (LIC Plan 189) Pension Plan ensure a financially secure retirement and guarantees your peace of mind. By choosing LIC Jeevan Akshay VI Pension Plan, you can make your dreams a reality, anytime, anywhere. Jeevan Akshay immediate annuity plan is perfect for somebody having a lump sum of cash who will be interested in instantly converting that sum of money into an assured revenue stream. Let us have a look the complete details regarding the LIC Pension Plan-Jeevan Akshay in the Following section. Note: The Plan Number for LIC Jeevan Akshay VI (Plan 189) with effect from 16th May 2012 shall be Plan No. 810. LIC Jeevan Akshay VI Pension plan provides for annuity payments of a stated amount throughout the lifetime of the Life assured. Various options are available for the type and mode of payment of pensions. Let’s check the key features of Jeevan Akshay VI Annuity Plan here. Single Premium: Policy Premium is to be paid in a lump sum. Minimum Purchase Price: For all distribution channels except online: Rs. 100,000/-. No medical examination: No need of Medical examination under Jeevan Akshay VI plan. No maximum limits for the annuity purchase price: Under LIC Pension Plan- Jeevan Akshay VI there is no Maximum limit for policy buying and the Annuity, etc. The Minimum & Maximum allowed age at entry is 30 years (completed) and 85 years (completed) respectively. Age proof of the Life assured is necessary. Under Jeevan Akshay VI pension plan seven different types of annuities are available. Check the different Annuities under this plan in the following Section. An annuity is guaranteed for 5, 10, 15 or 20 years and life after that. Annuity for Life with the return of purchase price on death. Annuity for life is increasing at a simple rate of 3% per annum. Pension for life with a provision for 50% of the pension to the spouse of the annuitant for life on death of the annuitant. Annuity for life with a provision for 100% of the annuity to the spouse of the life assured for life on death of the Life Assured. Pension for life with a provision of 100% of the annuity payable to spouse during his/her lifetime on the passing of annuitant with the return of purchase price on the passing of the last survivor. Jeevan Akshay VI Pension Plan is an Immediate Annuity Plan, which provides annuity payouts immediately after the premium payment for a financially secured life after the retirement of the life assured. Let’s check the eligibility conditions for the LIC Jeevan Akshay VI Annuity Plan here. For Online mode Rs. 1,50,000/-. 5,10,15 and 20 years and as long as life assured is alive. The new UIN (Unique Identification Number) for LIC’s Jeevan Akshay-VI retirement plan is 512N234V04. Jeevan Akshay VI Annuity Plan Benefits are available here. Let us have a look at the benefits offered by LIC Jeevan Akshay Pension plan here. Death Benefit: If in the case of death of the Life Assured, then the Annuity completely depends on the pension option which is chosen by the Annuitant. Tax Benefit: Under Section 80CCC of the Income Tax Act, the Premiums paid under the Jeevan Akshay VI policy are exempted from Income tax. The Pension, which is received, is taxable. Maturity Benefit: There is no maturity benefit under Jeevan Akshay VI retirement plan since this plan is to protect the risk of living too long and provided the pension immediately according to the selected option. Free Look Period: If the Life Insured is not satisfied with the “Terms & Conditions” of the Jeevan Akshay VI Retirement plan, she/he may return the Insurance policy to the Company within 15 days from the date of receipt of the Plan. Annuity Rate: Different Annuity rates are available for different types of annuities under Jeevan Akshay VI Plan. The policy can be purchased by one-time payment (Single Premium) which can be worked out by applying annuity rates for the type and mode of annuity opted by the Life Assured. The first installment of the annuity shall be paid 1 year, 6 months, 3 months or 1 month after the date of purchase of the annuity depending on whether the mode of annuity payment is yearly, half-yearly, quarterly or monthly respectively. Further, annuity shall be paid during the life time of the life assured with following provisions on death of the annuitant for different options are listed below. Under option (1): Payment of the annuity terminates. On the death of the life assured during the guarantee period – the annuity is paid to the nominee till the end of the guaranteed period after which the same terminates. On death after the guarantee period – payment of annuity ceases. Under option(3): Payment of annuity terminates and the purchase price is returned to the nominee. Under option (4): Payment of annuity terminates. Under option (5): Payment of annuity terminates and 50% of the annuity is paid to the surviving named spouse during his/her the life time. If the spouse predeceases the life assured, nothing is payable after the death of the annuitant. Under option (6): Payment of annuity terminates and 100% of the annuity is paid to the surviving named spouse during his/her the lifetime. If the spouse predeceases the annuitant, nothing is payable after the death of the annuitant. Under option (7): The Payment of annuity terminates. 100% of the annuity is paid to the surviving named spouse during his/her lifetime and purchase price is returned to the nominee after the death of the spouse. If the spouse predeceases the annuitant, the annuity ceases and the purchase price is paid to the nominee. The amount of annuity shall be assured throughout the period for which it is payable. Incentives for High purchase price: Under the policies where the purchase price is high, incentive by the way of increase in the tabular annuity rate will be given to the Life assured. The annuity rates are listed below. Incentives for Online sale: For Insurance policies sold online, a rebate of 1% by the way of increase in the basic annuity rate shall be available. Rebate for Corporation Employees: under CEIS a rebate of 2% of the purchase price will be available to eligible Corporation employees. But, Online rebate will not be available under Corporation Employee Insurance Scheme. The LIC Jeevan Akshay VI Pension Plan buying procedure is available here. Before purchasing the LIC new Pension Plan- Jeevan Akshay 6, read the Plan details carefully. This New LIC Pension Plan can be purchased in two ways either online or offline. For offline mode, Visit the nearest LIC Branch Office or Contact an LIC Agent of superior guidance. For Online mode refer the LIC India Official Website. Check the documents required for the LIC new Pension Plan 189 here. Proposal Form 440 (IA) / Application Form along with the Photograph. The Life assured can claim the LIC Pension Plan after the completion of the policy period. In a case of eventual death of the annuitant, the nominee can claim instead of the insured. Check the documents required for Claim the Jeevan Akshay VI Pension Plan here. Cancel check or Bank Pass book xerox. Death certificate ( If in the case of the eventual death of the life assured). LIC Jeevan Akshay VI Premium Calculator is used to calculate Premium amount for yearly, half-yearly, quarterly and monthly of any Policy. This LIC Pension plan calculator is used to estimate the benefits offered by the Jeevan Akshay VI Plan. Jeevan Akshay 6 Pension Calculator provision helps clients to calculate the premium amount and amount paid to the insured after maturity. For more details regarding LIC Jeevan Akshay Premium Calculator refer, www.policybook.in. Service tax, if any, shall be as per the Service Tax Act, India and at the rate of service tax as applicable from time to time. The amount of service tax as per the prevailing rates shall be payable by the life assured along with the purchase price. LIC Jeevan Akshay VI policy does not acquire any paid-up value. No surrender value will be available under the LIC New Pension policy-Jeevan Akshay VI. No loan will be available under the Jeevan Akshay VI policy. What happen if Life assured surrender the policy? No surrender value will be available under the LIC Jeevan Akshay Pension Plan. Is there any Loan facility available in this Plan? No, Under Jeevan Akshay 6 Pension Plan Loan facility is not available. LIC does not mention one critical information about this policy.Also I have read many blogs about this policy and this critical and most important information about this policy is missing.The Annuity amount is paid only if the policy holder survives on the payment date otherwise no amount is paid. Example, if the annuity option is yearly payment and if the policy holder even dies after 11 months, then no annuity is paid for 11 months that the Policy holder survived.So be careful with this policy.It is not paid for life but only if you survive on the date of payment.